Happy Independence Day from our family to yours. My heart is filled with utmost gratitude for those who have fearlessly defended our freedom and continue to protect our nation. What a wonderful country we live in! This Fourth of July, the Texas Parks and Wildlife Department has plenty of activities planned for friends and families all across our great state. From hiking and paddle boarding, to watching fireworks burst in the beautiful Texas night sky, there is an activity for everyone to enjoy this holiday. Both Mustang Island State Park and Lake Livingston are hosting free ranger-led kayaking programs this Fourth of July. 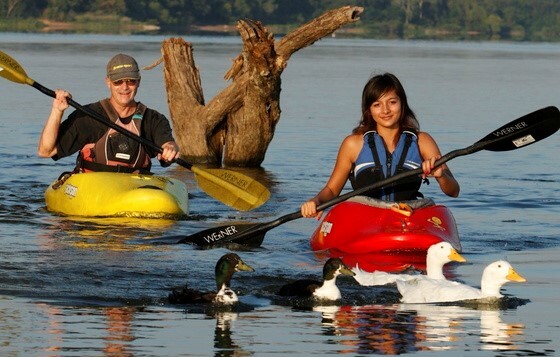 These programs teach the basics of kayaking while exploring the refreshing waters and aquatic animals of Texas. Hueco Tanks State Park and McKinney Falls State Park are celebrating Independence Day by inviting you and your family out to fish. At these beautiful state parks, families can learn the fundamentals of fishing while savoring homemade Fourth of July treats on the docks. Enjoy each other’s company and reel in memories that will last a lifetime. You can even exercise your creativity this holiday. Galveston Island State Park invites everyone out to the sandy shore to create their very own watercolor painting at its Beach Paint Party. Do you want to take a bike ride? Do it in style at Inks Lake State Park. Show your American pride by decorating your bike to ride in the parade with true patriotic fashion. Decorations will be provided and available before the parade. These are just a few of many activities for all to enjoy in the great state of Texas this holiday. To learn more about Independence Day events near you, please visit the Parks and Wildlife website. Please keep swimming safety tips in mind when you take a dip, and remember that fireworks are not permitted in Texas State Parks. The Abbott family wishes you and your family a safe and fun Fourth of July. God bless America!